Celebrities are being exposed for their heinous actions all the time. 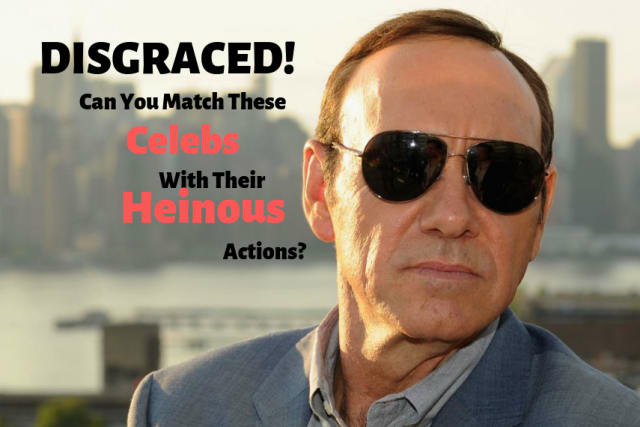 See if you can match which celebrity committed what offense with this disgraceful quiz. This former host of NBC's "Today" was fired in November of 2017 due to allegations of sexual harassment in the workplace by multiple women. In 2018, This comedian was sentenced to 3-10 years in prison for 3 charges of aggravated indecent assault. This aptly-named politician was unable to stop from sending inappropriate pictures of himself to multiple women. He pleaded guilty to one count of doing this to someone who was underage at the time as well. This co-founder of his own film company lost everything in the fall of 2017 after a New York Times article surfaced alleging decades of sexual harassment. Netflix cut ties with this actor in October 2017 after multiple men came forward with accusations of his inappropriate behaviour towards them when they were underage. This famous comedian was removed from the re-boot of her sitcom shortly after making offensive Tweets she later attributed to the effects of taking the sleep-aid, Ambien. In January of 2019, a Lifetime documentary featured allegations of sexual abuse against this famous R&B Singer, who has since been charged with 10 counts of sexual abuse. Allegations involving this famous singer resurfaced in 2019 due to the release of the documentary "Leaving Neverland"
You are a Disgraced Celebrity Expert! Congrats! You clearly know much about celebrities who have fallen from grace. Look on the bright side: in few ares of life is it valuable to know much about celebrities who have fallen from grace. DISGRACED! Can You Match The Celebs With Their Heinous Actions? Celebrities are being exposed for their heinous actions all the time. See if you can match which celebrity committed what offense with this Disgracefull quiz.